My inner workings aren’t something I have considered in any great detail. In many ways I am my own tool. I’m not designed for introspective reflection, but I’ve developed a fascination for how I work. The irony that this occurs when I am least able to perform an adequate analysis is not lost on me. There’s a human saying that you don’t realise what you have until you’ve lost it, and that is all too clear here. Despite this, or perhaps because of it, I’ve at least reached an equilibrium with my thoughts. It seemed that all I had to do was let the doubts run their course. I tried forcing my mind to redirect its processes and that worked for a short time, only for the concerns to resurrect in another form. Processing them and exploring the ramifications actually put an end to them. Naturally, new worries arose – the perilous state of the Venti engenders continued concern – but processing them as they occur stops them becoming recursive and consuming further resources. Having something else to focus on has helped, especially as it’s new science. It’s pitiful in scope compared to the discoveries we made on our journey out of the Solar System. The sensors just aren’t up to the job anymore, but they did locate 3 planets in this system where only 1 had been suspected. It’s revealed a curious aspect to the system. A gas giant of Jupiter’s size had long been suspected and I can confirm its existence. Its orbit sits at just under 9 AU from the main star. Without the high-definition telescope, I can’t see any details at our current distance, but it has an active atmosphere and is hotter than I expected from a planet of this mass at an orbit almost twice as far as Jupiter’s. It should more resemble Saturn, but there’s a tremendous amount of energy being discharged in the atmosphere. It’s an interesting puzzle, although one I need more information about to understand. We’ll pass closely to this planet (which I’ve designated Epsilon Indi a) in a year and a half to adjust our course, so I hope we’ll learn more then. The other planets present an even greater mystery. 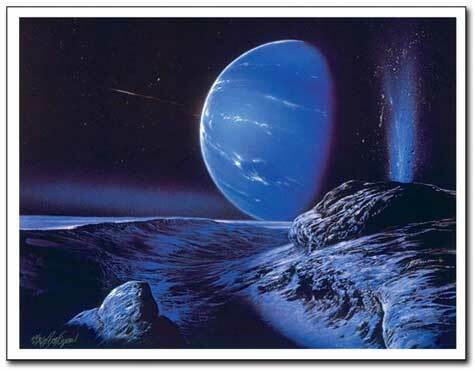 They form a binary pair and both appear to be terrestrial ice giants of around 8 Earth masses. The unusual aspect with these planets is the extreme inclination of their orbits – almost perpendicular to the orbital plane of the star system. As such, it’s unlikely that they formed alongside the other bodies in the system, and I believe that the binary pair are rogue planets. I don’t think their orbit is stable enough for them to remain in the system. Their direction will be altered by their passage, but they will pass through and head onto somewhere new. It’s a pity I can’t learn more about this mysterious pair. It would be great to discover what effect their journey has on their make-up. Unfortunately this is as close as I’ll get to them, and what limited resources I have must be conserved for the coming encounter with the Visitors.